According to Shamar Rinpoche’s advice Trehor Lama will give further explanations about the 35-Buddha Practice. This is a powerful purification practice, followed by mandala offerings to accumulate merit. Trehor Lama will explain both, will practise together with us and will clarify questions. We are looking forward to another course with powerful teachings of Trehor Lama. Trehor Lama is a Tibetan and completed an intense education in study and practise. 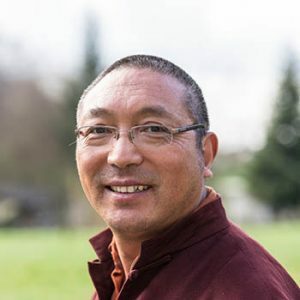 For many years already he is been leading the Karmapa-Institute in Valderoure, France, following the requests of HH Karmapa Thaye Dorje and Shamar Rinpoche. His intense teachings impress and inspire by his clarity and joyfulness.